That’s my most recent order and I’ve been intrigued by the My Clarins range so I’m excited to try two of those. These will be ideal for traveling. 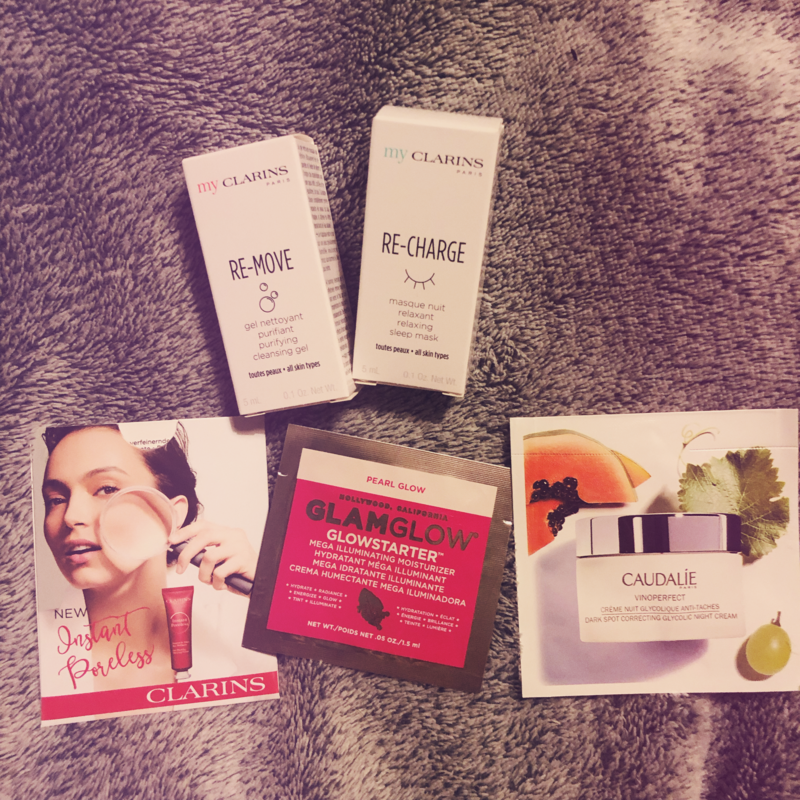 I love primers and this instant poreless one, again from Clarins could be right up my street. I love Caudalie stuff and I’ve noticed a few dark spots on my face (I had these after both my pregnancies so I guess they have intensified in my old age… ahem) so intrigued to try the Glycolic Night Cream. Also very intrigued by the GlamGlow Mega Illuminating Moisturizer. Only just realised that this is the first one for a while that hasn’t had perfume in. Sometimes they are just all perfume, it depends what is available. I set up a reminder each month to get my order placed and then a couple of days later it arrives and I can start going through my new stash of samples. It’s a great way to try out products before buying the full size version. There’s a few of the Caudalie range that I have bought from having a sample first. There’s always something new to try out which is great for how many years I’ve been using it. There’s also samples for men’s skincare and fragrances too, they shouldn’t miss out! If you are new to Feel Unique you can sign up HERE and get 15% off your first order (not Pick ‘N’ Mix). Affiliate link.